Styr Hardrata stood, eager to escape the confines of this place. He struggled to open the door, but when he stepped outside, he breathed in the scent of freedom. All was quiet, the night cloaking the sky with darkened clouds. In the distance, he spied the flare of a single torch. He gripped the chains to hold his silence as he tiptoed into the night. Soundlessly, he made his way towards the beach where he saw her staring intently at the sand. Alone, with no one to help her. In her face, he saw the dogged determination to survive. It was breaking her down, but she kept searching. He’d known men who were quicker to give up than her. She walked alongside the water, the torch casting shadows upon the sand. In the faint light, her face held a steady patience. Her skin was golden in the light, her brown hair falling over her shoulders in untamed waves. She was far too gentle for her own good. What kind of a woman would capture a Norseman and then give up her own food? Why would she bother treating his wounds, when he’d threatened her? And why was there no man to take care of her? No husband or a lover . . .
Styr remained in the shadows, even knowing that he shouldn’t be here. He ought to be studying the perimeter of the ring fort, searching for hidden supplies or information about these people. Instead, he couldn’t take his eyes off Caragh, as if she were the vision of Freya, sent to tempt him. Like the women of his homeland, she possessed an inner strength he admired. Though Fate had cast her a bitter lot, she’d faced the grimness of her future. Taking him prisoner was the action of a desperate woman, not a cruel one. He knew within his blood, that if he left her now, she would starve to death. He shouldn’t care. He owed her nothing. And yet, he couldn’t bring himself to walk away. Look for To Sin with a Viking, available July 23rd, 2013, from Harlequin® Historical. You can read more about the book and find pre-order links here or join the discussion on Facebook. (P.S.–it’s on sale for $1.99, starting July 17, for a limited time). The model, Taylor David, arrived in his street clothes. 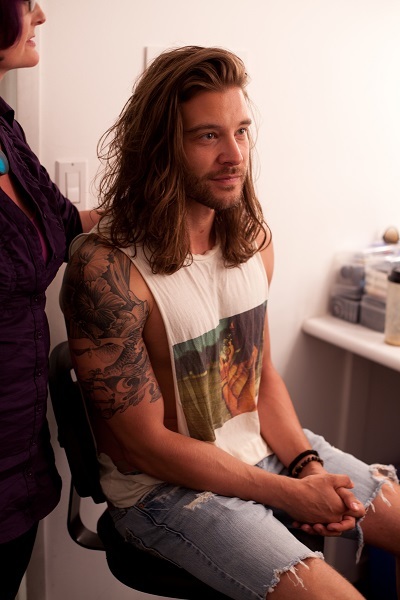 I talked with the make-up artist Jukka about what we wanted for the Viking. He asked if I wanted Taylor to shave, and honestly—-I wasn’t sure. I liked the grittiness of an unshaved hero, but I didn’t want a strong beard and mustache. We opted to trim down some of the beard to make it more like stubble but keep the raw quality. To ensure that the book cover didn’t resemble Tempted by the Highland Warrior too much, we had to make some changes to the model’s hair. Jukka asked me what I wanted him to do, after the art director, Krista Oliver, thought we should pull part of the hair back. 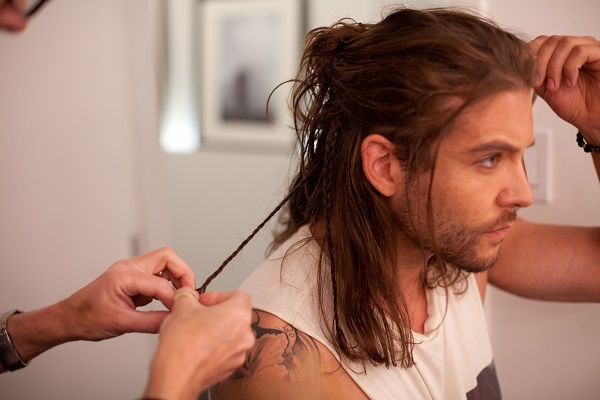 I agreed with Krista and also suggested a few war braids, which he added. 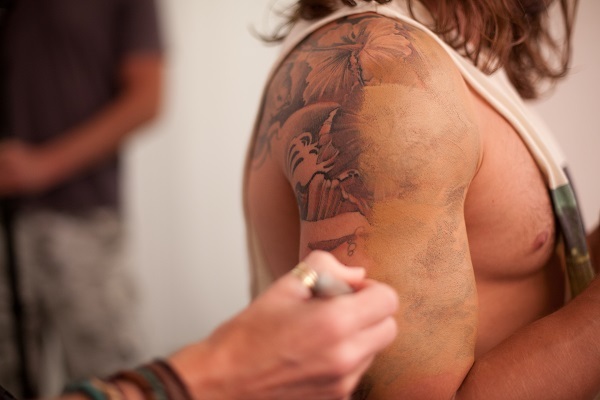 Taylor has some tattoos, and we opted to cover one of them and leave the other uncovered, in case we wanted to use it in the photo. We talked about how the hero was shipwrecked, and Jukka added a scar to Taylor’s forehead, giving him a bit more character. He also added eyeliner and light make-up to define his features. Then it was time to dress the Viking! Taylor put on a pair of leather leggings and an amber-colored shirt that looked as if it was made of a fishing net. Marie-Eve then put a grayish apron on him. I teased him that he looked like he was about to bake cookies in that apron. But again, this was part of the optical illusion of layering. Next, Marie-Eve put him in a black leather tunic with red embossed cross studs. Once she had him belted in the outfit, it started to come together. She added metal arm bands and gave him a helmet as a prop. Enjoy book 1 in the Forbidden Viking series – To Sin with a Viking. Next week, find out what other props were added, and you’ll see the actual photoshoot! Read about part 3 of the photo shoot here. If you would like to comment or ask questions, join me on Facebook or Twitter. On June 24, I had the experience of a lifetime. 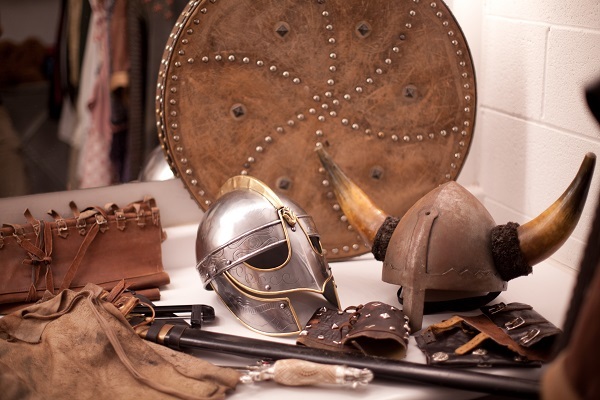 I was invited to watch the photo shoot of Book #2 in my Forbidden Vikings series, To Tempt a Viking (February 2014). I never expected to have an opportunity like this, and it was an unforgettable day. I thought I’d share a series of blog posts so you could get a behind-the-scenes look at what goes into a book’s cover shoot (Photos courtesy of Jon Wayne Brown). 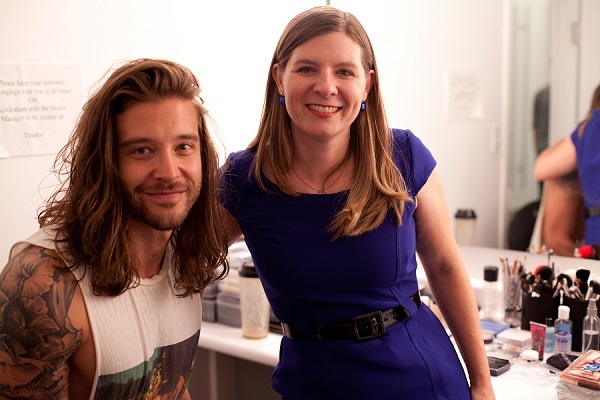 I walked into Westside Studio on June 24th, and at first glance, it’s like any other office. When you walk to the back, there’s a long hallway with framed photographs along the left wall. On the right side is the hair and make-up room, which is fairly small (you can cross the room in about three paces). Beyond the make-up room, through another door, is a costume room. It’s a smaller space, perhaps two paces wide and three paces long. A large mirror hangs on the left wall, and a long rack of costumes stands against the wall opposite the door. Swords, helmets, and shields are there for the medieval/Viking books, and on the counter there are plastic divided containers filled with jewelry. The stylist, Marie-Eve(shown in the photo below), labeled one of them “Wedding bling.” The costumes are divided on the rack by the title of the book being shot and with the model’s name and measurements. What struck me about the costume room is how many accessories there are. Scarves, tunics, arm bands, weapons—you name it, it’s there. Sometimes opera costumes are repurposed for the photo shoots. When you look at the dresses on the rack, some of them seem frayed or not that attractive, but for photo shoots, it’s about layering texture and fabric. A brocade that looks worn down on the hanger might appear lustrous with all the lighting on set. A shirt that appears as if it’s made of fishing net has a raw texture that resembles chainmail. Sometimes the stylist will add a lace ruffle to add texture to a gown or take it away to make it appear more medieval. Marie-Eve bought a ladies’ turtleneck and cut it apart to make a neck piece that resembles a cowl. Anything with a texture or an imprint on the fabric works well for photography. They say that the clothes make the man. 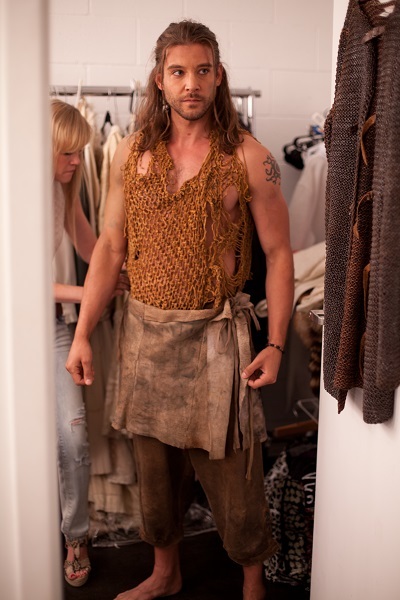 Next week, we’ll talk about how the clothes (and the make-up, and the photographer) make the Viking . . .
You can read about part 2 of the photoshoot here. Want to ask questions or comment? Join me on Facebook or Twitter and ask whatever you’d like! During the long wait on Her Irish Warrior, I received revision requests on the complete manuscript. After making the revisions and sending them back, I was left with nothing to do except write another book. I found that Connor MacEgan was one of my favorite MacEgan characters. He was a flirt, had a devilish smile, and could win the heart of any woman. He was a perfect man. Which meant, in order for him to grow as a character, he had to be broken down. Literally, I had one of his flirtations go too far and the angry father tortured Connor by crushing his hands and breaking his wrists. For a warrior who depended upon his sword to protect himself and his family, this was a horrifying fate. Fortunately for Connor, he was found by a beautiful healer . . . and a woman who holds secrets of her own. Aileen O’Duinne lost her heart–and her innocence–to Connor as a young maiden. He was her first love, and she never forgot him. When she finds Connor injured, she heals his wounds, but he’s angry about having lost his ability to fight. He wants to heal faster and despite Aileen’s skill, he lashes out at her when his hands aren’t recovering quick enough. He falls into despair and doesn’t know how to become a different man when he can no longer use his hands. My brother doesn’t have the use of his hands. Born with physical disabilities, he cannot hold a pencil or write well. He can’t cup his hands or tie shoes. But it doesn’t make him less of a person. Instead, I admire him more for what he can do, in spite of his problems. His strengths are far different from ordinary people, and his memory is astounding. I wanted to explore a character in fiction who suffers the same troubles but who overcomes them in his own way. Not only that, but he learns to love a woman who sees beyond his broken hands to the man beneath it all. You can read more about The Warrior’s Touch here or join the discussion on Facebook. (P.S.–it’s on sale for 99 cents, for a limited time on Amazon). After writing Her Irish Warrior (and awaiting a decision from Harlequin), I wanted to try a different time period entirely. I also hoped to write a longer single title book that would be different from anything else I’d written. I love to bake and have enjoyed it since I was a girl. I own several Victorian era cookbooks, and I decided to give my heroine a love of cooking as well. At the beginning of the chapters, I put quotes or recipes from Emily Barrow’s fictional cookbook–recipes that were adapted from real historical recipes (or receipts, as they used to call them). In order for readers to be able to actually bake the confections, my editor and I converted some of the measurements. I baked several of the recipes and adjusted measurements along the way. It was a conscious choice to make the novel work as a cookbook, as well, and this is why I adapted the primary sources into measurements a modern reader could use. Emily Barrow is a very strong-willed, unconventional heroine. What’s interesting to me, as an author, is how readers react to her. There seems to be no middle ground whatsoever–readers either love her or despise her. I never imagined that there would be such violent opinions on this book, but reviews tend to be skewed from one end of the spectrum to the other. I also incorporated a mystery element in the plot (It’s essentially a Cinderella story after she marries her Prince Charming–only now, he has no memory of her OR the marriage.). I had a vague idea of who my villain was, but in order to make the writing more entertaining for myself, I didn’t make a decision until near the end of the book. In some ways, I think it helped the whodunit element, because *I* didn’t know whodunit. The Accidental Countess was an early book of mine, written before I’d published anything. I broke a lot of rules, wrote with abandon and just had fun with it. Although it was completed in 2006, my agent shopped it around in 2007. I gave birth to my third child in the fall of 2007 and due to some heavy revisions on Her Warrior Slave, I found myself woefully behind on the next book that was due only three months later. 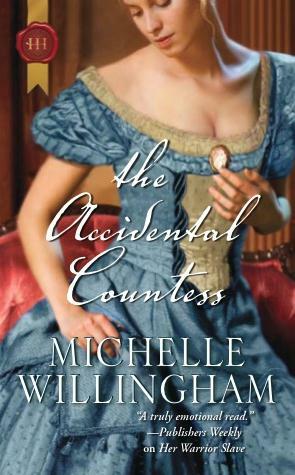 Since I was teaching full time, I had only one option to meet that deadline–send the full manuscript of The Accidental Countess to my editor at Harlequin. I did sell it in early 2008, but I knew it would be a long time before it would see publication. We ended up holding on to the book until 2010, because my editor wanted me to write a second Victorian manuscript to go with it. 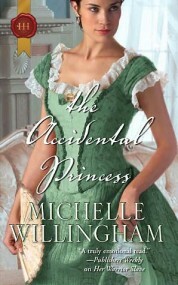 I wrote The Accidental Princess in the meantime, and both were published back to back in February and March of 2010. This book is one that I sometimes want to shield from criticism. If I had to go back and rewrite it, I might soften Emily a bit more. But 2006 was a time of experimenting for me, of trying new things and learning what worked and what didn’t. That’s a necessary part of developing your author voice. Yet I know many readers who do love this book and the rest of the series. It *is* different from my MacEgans and my later books because *I* am a different author now than I was, years ago. Will you love it or hate it? That’s entirely your choice. View more details about the book here or join the discussion on Facebook. After my first manuscript was rejected and set aside, I decided to try a new way of writing romance. Instead of creating characters and a set of events that happened to them, I decided to write a story about broken people. REALLY broken people. I killed off my hero’s first wife and child and made him a brooding Irish warrior. He had also witnessed the death of his eldest brother and was unable to save him. Bevan MacEgan had emotional baggage with a capital B. He was one messed up man, and I loved him immediately. But what kind of heroine should he have? A bold Irishwoman wouldn’t work for this man. He needed redemption after being unable to save so many people, and so I created Genevieve de Renalt, a woman desperately in need of a rescue. Like Bevan, Genevieve had her own problems. Not only was she a Norman bride brought over to wed another man who had claimed Bevan’s land, but she was struggling to find the courage to leave her betrothed. When Bevan does help her escape, he’s haunted by memories of his first wife, and he keeps her at arm’s length. Genevieve is attracted to this man, but he wants nothing to do with her, aside from getting his land back. Instead of crafting a story about events, I chose specific incidents that would push them to overcome their past. Bevan needed a chance to succeed in protecting someone. Genevieve needed to find her sense of self-worth. And when both of them are pushed to their limits…when he receives word that his first wife might not be dead after all, their love faces the ultimate test of all. When I finished the book, there was something special with this story. It was different from all the other manuscripts because the conflict came out of these two people. It felt as if this book had a chance to be published. And still, I received rejections from many publishing houses. Some wrote notes that they really enjoyed the story but it wasn’t quite right for them. I got a request from Harlequin, and mailed off the book while working on an entirely different story (The Accidental Countess). The book was also rejected by Harlequin. I was upset by this, but realized I could also try the Mills & Boon division of Harlequin in the UK. Only later did I learn that Mills & Boon had taken over the Harlequin Historical line. I worried that I would receive an instant rejection, since the New York office had turned it down. To my surprise, I received a revision request. They were an 11. Not in terms of tons of work, but because I had no idea how to make the opening more character-driven. I poured everything I had into those opening chapters, adding more to what the characters were thinking and feeling. I tried to make Genevieve’s fears more real, more terrifying. And when I sent it off, I had nothing left to give. On September 15, 2006 at 10:03 in the morning, my editor called and offered to buy the book. 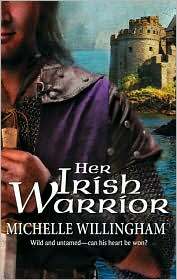 Her Irish Warrior was published in May of 2007. It will always be special to me, because it was my first book. And it’s still funny to me that Harlequin both rejected and bought this story. It might surprise you to learn that Her Warrior King was the first MacEgan book I wrote. Inspired after a trip to Ireland in 1993, I kept wondering why I hadn’t seen more Irish medieval romances. Scottish medieval stories were everywhere–why not Ireland? The story idea kept turning over in my head, but I put it aside for many years because I had no idea how to write a full-length romance. I had tried earlier with a Western, but ultimately I never finished that manuscript. It was full of flaws, plot holes, and wooden characters. Finally, I decided to write the first draft of Her Warrior King. I named it My Wild Irish Rogue as a working title and set to work crafting Patrick and Isabel’s story. I’ll admit, it was a lot of fun. I loved Isabel’s spirit and Patrick’s brooding ways. I threw myself into the book, inventing all sorts of disasters to befall them. In the end, I finished the story and realized that it, too, was a disaster. There was no love story. It was nothing but a series of misfortunes, strung along through 350 pages. Neither character developed or changed, and although I submitted it for publication, it was rightfully rejected. I learned a great deal from that failed book. For the first time, I understood that at the core of a romance, it was about two people putting aside their past to fall in love. I put Her Warrior King away and began writing what would become Her Irish Warrior. That book went on to sell, and I continued writing the MacEgan brothers, with The Warrior’s Touch. But I never forgot about Her Warrior King, and I kept wanting to go back to Patrick and Isabel. I loved these characters, and although the manuscript was awful, they deserved a book of their own. I threw out all of that book except the first two chapters and wrote a brand new book for them. This time, I focused on how Isabel was trying to make the best of her new life as queen and how Patrick kept trying to shut her out. I kept the emphasis on a lonely woman who was attracted to this fierce Irish warrior, and how she desperately wanted to fit in. He, too, was a tormented hero who didn’t want to love the daughter of his enemy. He was torn between choosing the needs of his tribe and the needs of his heart. It was a better book this time. 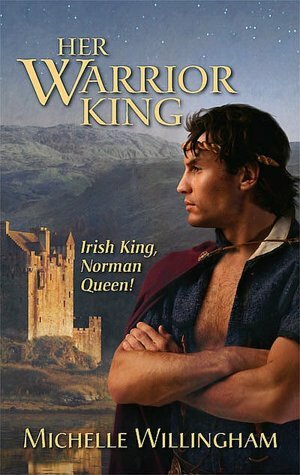 And it sold to Harlequin Historical, after I’d already published Her Irish Warrior and The Warrior’s Touch. Many people often wonder why the books were published “out of order,” and although they can be read in any order, this is why. It’s because the first version of Her Warrior King didn’t deserve to be published. I learned from my mistakes, and thankfully, that first manuscript draft will never see the light of day. Sometimes characters stay with you and demand that their story be told. Patrick and Isabel fit into that category, and I’m glad I tossed out that early manuscript to write the one that suited them best. Questions or comments? Join the discussion on Facebook or Twitter. There are some great book deals going on right now! First, The Warrior’s Touch is still on sale for only $0.99 on Kindle in both the U.S. and Canada. Second, my Accidental series is on sale through March 15 for less than $2.00 per title in all e-book formats. The first story is a novella prequel to the series, “An Accidental Seduction.” It’s on sale right now for $0.99 from all major retailers (Kindle, Nook, and so on). Now Stephen has returned to find Emily destitute and alone. He has vowed to help her without compromising her honor…but Emily has other ideas. She doesn’t want his charity, but she does long to know what it would be like to take him as a lover, even if marriage is out of the question. Confined to close quarters with their passion burning as brightly as ever, will Stephen be able to resist the temptation and rescue her, or give in to his desire and completely ruin her? When Stephen Chesterfield, the Earl of Whitmore, awakes to find a beautiful woman berating him, he knows he is in trouble! He cannot recall the past three months of his life, never mind having a wife! What’s more, someone is trying to silence him before his memory returns…. Emily Chesterfield is trapped in a marriage of convenience with a man who doesn’t remember her. Stephen clearly thinks she is the most unsuitable countess, but she is falling for her enigmatic husband…. Can they find trust and love before it is too late? Lieutenant Michael Thorpe is a forbidden temptation for Lady Hannah Chesterfield. Etiquette demands Hannah ignore the shivers of desire his wicked gaze provokes, but he’s the only man to recognize her restless spirit, and her unawakened body is clamoring for his touch…. 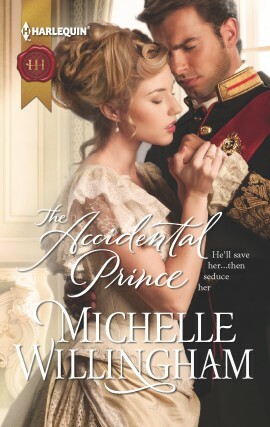 Thrown together by scandal, a defiant Hannah joins Michael on an adventure to uncover the secret of his birth–is this common soldier really a prince? If so, will the ordinary man who has taught Hannah the meaning of pleasure now make her his royal bride? If you enjoyed the Accidental series, the last title is now available in stores. On March 1st, it releases from Kindle and Nook. Princess Serena of Badenstein intends to flee—from her violent father and from the man to whom she’s been pledged in a political marriage of convenience. Karl von Lohenberg is without a country, a title—and a bride if he lets Serena get away. A ruthless man, he takes her to a secluded island, hell-bent on seduction. Only, he discovers a broken woman behind the prim princess facade. The time they spend together mends her spirit and touches his soul, but how will she react when she finds out how he’s deceived her? 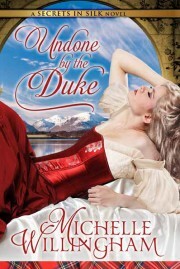 Finally, don’t forget–Undone by the Duke is still available for only $3.99. Enjoy the Spring book sales! Congratulations to all winners, and thank you for helping me celebrate the release of Undone by the Duke! It’s time for giveaway #6! If you missed giveaway #1 for one of my books, giveaway #2 for Larissa Ione, giveaway #3 for Margery Scott, giveaway #4 for Kristan Higgins, or giveaway #5 for Connie Brockway, you can still go back and enter them. Maisey Yates has been a good friend of mine since she blazed onto the bestseller lists with her Presents alpha males. She’s offering up a copy of her newest book, Heir to a Desert Legacy. Thrust reluctantly to the throne, Sheikh Sayid is shocked to discover a child who is his country’s true heir, and he’ll do anything to protect him, even if it means taking on the child’s aunt! Chloe James might behave like a tigress protecting her cub, but this trained soldier can see her weak spot. Taking Chloe as his bride would appease the people of his kingdom, and provide the perfect outlet for the blistering chemistry between them…. Make sure you follow both of us, so we can send you a direct message if you’ve won. If you don’t have a Twitter account, please sign up for my newsletter below (if you haven’t already) and send an e-mail to me, telling me whether you’d prefer print or e-book, and if it’s print, please include your name and address. One winner will be chosen from Twitter and one from e-mail. You can enter both! Good luck, and all winners will be announced tonight.